Crassula natans var. 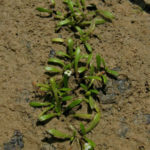 minus is an annual plant with decumbent, filiform branches up to 4 inches (10 cm) long and often much branched when growing on a marshy substrate, or slender floating branches up to 14 inches (35 cm) long. 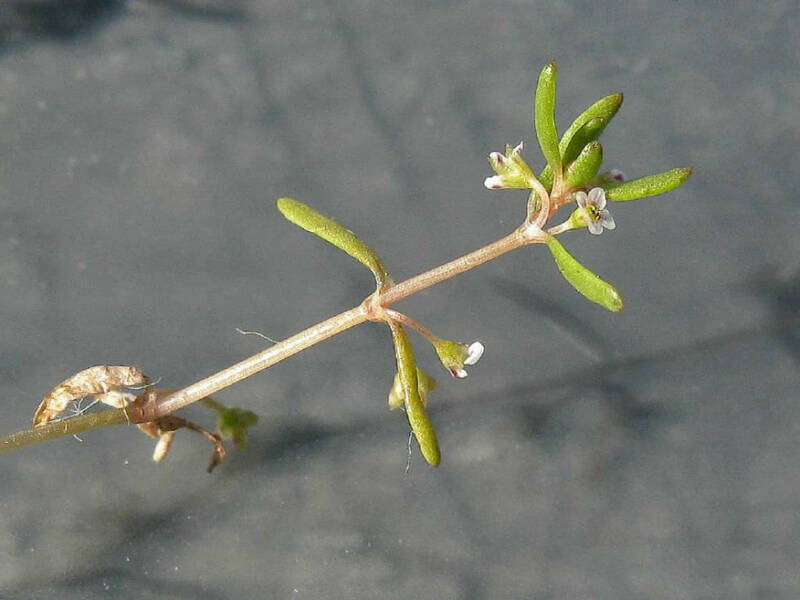 The leaves are linear, up to 0.3 inch (8 mm) long and 0.04 inch (1 mm) wide in marsh plants, or up to 0.6 inch (1.5 cm) long and 0.08 inch (2 mm) wide in plants with floating branches, dorsiventrally flattened and slightly fleshy at least in marsh plants, green to a pale reddish-brown. Inflorescence a single flowers (rarely 2 or 3 in marsh plants) in the axils of the leaf-like bracts with tiny white flower. Flowering between summer and fall but may continue as long as moisture is available. It is grown as an annual plant, so it has no USDA hardiness zone. This Crassula is endemic to the wetlands of Cape Fold area of the Western Cape region of South Africa. 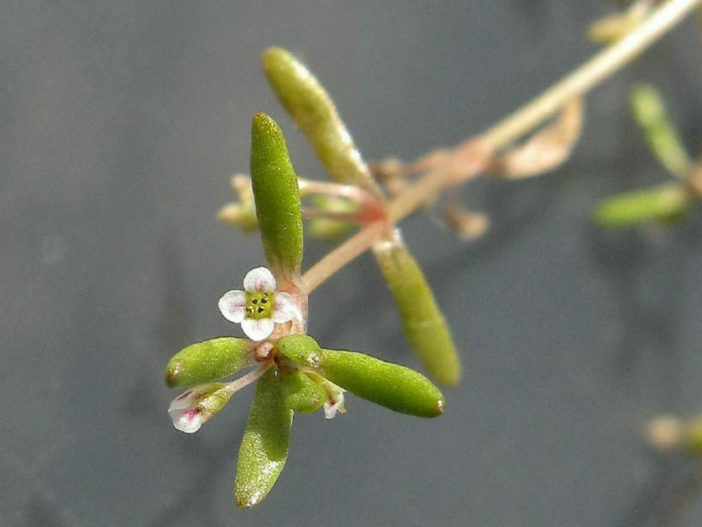 It has become naturalised in Western Australia where it is found in winter wet depressions and in gullies and lakes in the Great Southern, Wheatbelt, South West and Peel regions. It is also found throughout southern South Australia, New South Wales and Victoria. 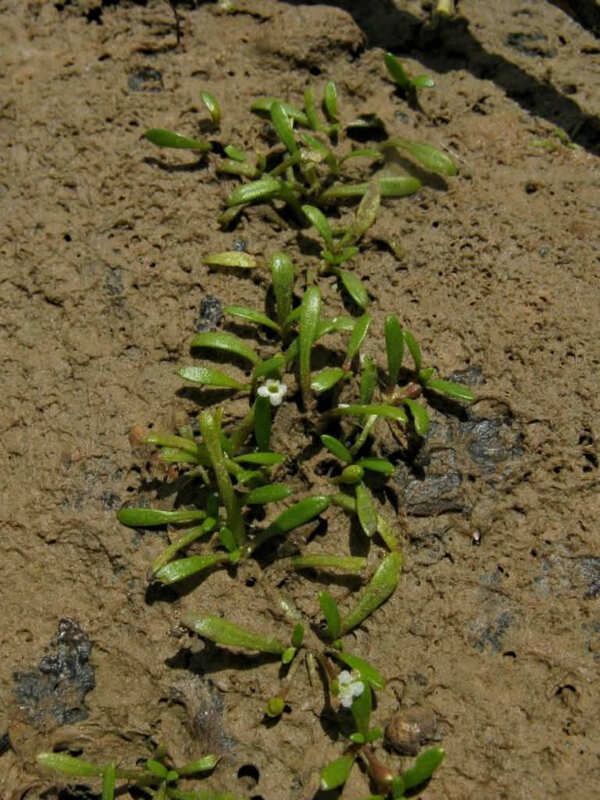 It grows in moist soil often in clay-pans and in and around shallow standing water of dams and rock pools. On moist soil plants are often deep red, tufted, less than 2.4 inches (6 cm) tall and with up to 3 flowers per node. 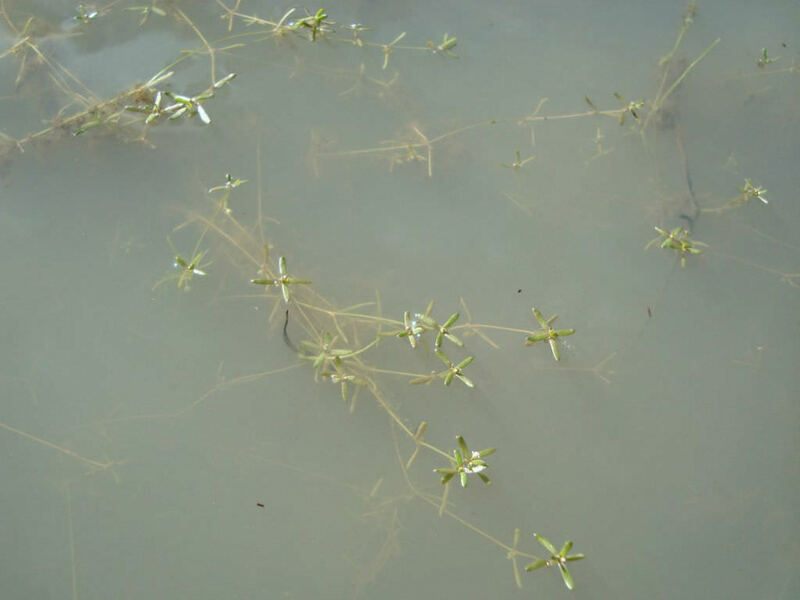 When inundated the floating branches become up to 14 inches (35 cm) long, are swollen at the base where they bear linear leaves while the floating leaves are oblanceolate and much broader, and produce rarely more than 1 flower per node. 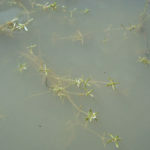 The floating stems are little-branched, and may be unbranched in plants growing in rock pools without much organic matter. Collect whole plants that are drying off, turning red-brown with mature fruit-spikes. These will contain very small brown seeds when rubbed with your fingers. Place the plants in a tray and leave to dry for 2 weeks. Then rub the plants gently by hand or with a rubber bung to dislodge the seeds. Use a sieve to separate the unwanted material. Be very careful as the seeds are very small. Store the seeds with a desiccant such as dried silica beads or dry rice, in an air tight container in a cool and dry place. 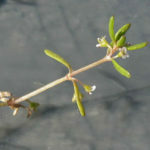 Crassula natans var. minus is native to southern Africa.